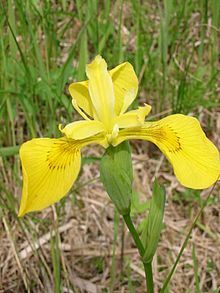 Iridaceae are perennial herbs from rhizomes, bulbs or corms comprising about 80 genera and 1,500 species. The leaves are distichous and have a sheathing, equitant base and a generally ensiform or linear blade with parallel venation. The flowers are bisexual, usually showy, and are actinomorphic or zygomorphic. This page was last changed on 30 July 2016, at 23:47.